Tucked into the heart of the Ozarks (northwest corner of Arkansas), about an hour (50 miles down country roads through a couple of hollows) from the lights and electronic music of Branson lies Eureka Springs. The only entire downtown on the US National Register of Historic Places, it is listed in “1000 places to see before you die”, and for the second time has been chosen as one of The Great Towns in America. Called the “gem of the Ozarks”, it is also known affectionately as “Little Switzerland of the Ozarks”. Native people settled here for the waters, believing the mineral springs had healing properties. When that notion reached settlers moving west, they too came. Trains, making the area even more accessible, created growth resembling San Francisco 1850s boom times. 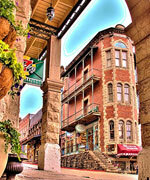 The Eureka Springs Historic District is one of the most popular tourist destinations in Arkansas. Victorian era homes hug cliffsides along streets that rise and fall in a series of whirlpool-like circles within the curvy, hilly topography in a 5-mile long loop. Very scenic but drive slowly. It’s the “Wedding Capitol” of the mid-south, with more than 4,000 weddings performed each year. No blood tests or waiting period – marriage licenses may be purchased at the local Court House. Many reasons to visit: Thorncrown Chapel (4th best architectural achievement of the 20th Century), White River trout fishing, spa treatments, fine restaurants, picturesque one-of-a-kind shops, boutiques, galleries, craft shops, wonderful Ozark mountain and lake scenery. 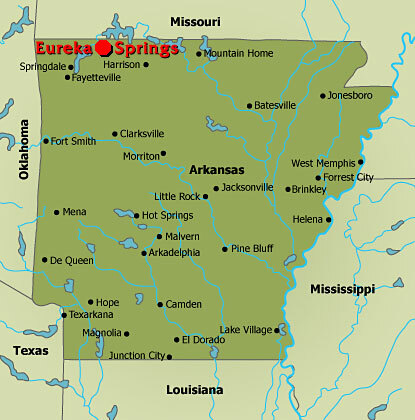 Filled with creative types – artists, writers, musicians, intellectually curious – Eureka Springs describes itself as a “college town without a college”. Totally charming – perfect for a long weekend or 2-week extended vacation. Here’s what we saw/did in 2 1/2 jam-packed days. Newly opened May 2009. Built at some $155 million on land formerly owned by Tennessee Ernie Ford, and said to be the largest privately-owned commercial airport in the U.S. Construction involved flattening the tops of nearby Ozark Mountains and carving roads through them – thought to be the largest earth moving project in Missouri history. Closest commercial airport is Springfield-Branson National Airport, 50 miles northwest of Branson, owned by the City of Springfield. Sitting on top of Crescent Mountain like a European chateau overlooking the town, this “Grand Old Lady of the Ozarks” opened in 1886 to be the finest hotel west of the Mississippi. 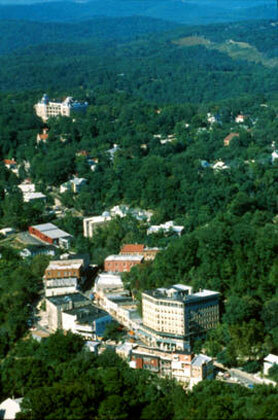 In the late 1800’s, when a new railroad brought thousands of tourists to Eureka Springs for the recuperative health treatments of the mineral rich hot springs, the hotel flourished along with the town. Has a rich and colorful history – having served as a luxury hotel, all girls school and cancer hospital run by Dr. Baker, a snake oil salesman. Fell into disrepair over the years, but has been restored to its former Victorian glory. Now a National Historic Hotel – and also considered by many to be the most haunted hotel in America! Clean, cozy, candlelit, semi-fine dining, color-print tablecloth restaurant. Excellent, inventive cuisine and professional friendly waitstaff. Wine list mostly Napa/Sonoma greats with notable European varietals also featured. Good location at the start of Main Street. Highly recommended by hotel concierge and others – a local favorite. Great dining way to begin a visit! Quirky, rambling, tiny bit freaky – and a lot of fun. Hotel investigated by TV show “Ghost Busters” which found paranormal phenomena all over the place. We take some unusual pictures that we’re still puzzling over. Room 419 hosts a ghost dubbed Theodora, believed to be one of Baker’s cancer patients, who sometimes introduces herself to surprised guests and housekeepers. We happen to be staying in 419! Full buffet breakfast available in the large dining room with view of the gardens and porches. Leisurely and luxurious way to start the day. Much to see here – allow more time or come back for several visits. You get here by going down a little wooden staircase leading down to 53C (between 53 and 51 Spring St.) and then it gets interesting. 2 SMALL rooms we ate in the back (only 2 tiny tables) ordering off the handwritten wall menu (over the water heater). One cheffette, one sassy waitress prepare and serve great Ark-Mex food with many vegetarian options. Retro funky. They don’t advertise or have a website — don’t miss the cultural experience. First performed in 1968, The Play (styled after that of Oberammergau, Germany) has been seen by over 7.5 million people making it the largest attended outdoor drama in America. The outdoor performance is staged 4 or 5 nights a week from May through October in the 4,100-seat amphitheater. Too early for the first show, we had a backstage site tour. Also nearby on the grounds is the Christ of the Ozarks statue the largest Christ statue in North America a popular place for weddings. Built in 1892, this first new major attraction to open in Eureka Springs in over a decade is an immersion into the rich culture and history of the 19th century. In a pre-opening tour of the entire museum we saw fine artisanship, architecture with balconies and wrap around porches, beautiful carved woodwork, original stained glass, musemum quality furniture and a collection of fine 19th century decorative arts. Buffalo Bill and Harold Bell Wright visited this home. An addition to the house includes art gallery space and public rooms. Memorable, must-see experience. Wine in Arkansas? Well, yes sort of. Not exactly Napa/Sonoma but Arkansas’s newest winery is located in Eureka Springs. The vineyards, in the hills of Keels Creek, about 3 miles from the city limits are not yet mature enough to supply all of the grapes needed for the winery. But the winery has begun producing wines, many of them somewhat exotic hybrids which we sampled. Wine production is small, mostly sold out. A valiant effort stay tuned! This largest lifelong refuge (USDA licensed) for abused, abandoned and neglected big cats in the world is home to over 100 lions, tigers, cougars and leopards, and other animals. Tanya Jackson Smith, founder and president of the Refuge, whose family sold everything they owned in order to buy the land and set up the Refuge, gave us a guided tour. Without the Refuge, 90% of the animals would now be dead. Perched on a hilltop with extensive acreage and great views, their Zulu Safari Lodge comfortable canvas structures with private baths, individually decorated offers big cat lovers a place to stay in total comfort nearby the magnificant animals and contribute to the mission. Very well designed. Eureka Springs’ number one recommended restaurant for many years is located on the Historic Trail in a Victorian cottage surrounded with blooming gardens. Excellent Italian food prepared using grandmother’s recipes: quick, attentive service. Casual, comfortable, nice experience. Order Tiramisu for dessert if calories are not important. Delicious! For some local regional entertainment, we take in an evening of classic country music and comedy theater. The 7 performers sing, play and comedy their hearts out for over 2 hours (with an intermission). We even get to talk with the performers at intermission and after the show. The show has been playing in various incarnations for over 36 years and has the distinction of being “Arkansas’ first and most attended family show”. We come away smiling and fully popcorned. Very Ozarkian and worth experiencing. The full name of this collaborative creativity studio is Fire Om Earth Retreat Center & Working Studio of Artists Lorna & Craig Trigg Hirsch. These folks do it all: hand crafted musical instruments (drums. flutes, ocarinas), ongoing classes in Yoga, Tai Chi and Belly Dance plus creative workshops, house concerts, and private and group retreats, massage, Sweat Lodge, Watercolor class, custom retreat Classes & Workshops. We come by to view true artists/entrepreneurs in action. From Main Street you go down a number of stairs to enter (apparently the bulding was street level at one time but they later raised the road). They’ve won a number of food awards through the years, including: Best Breakfast, Best Coffee, Best Dessert and Best Family Restaurant. A “must” for breakfast or lunch — see for yourself. Very nice 50-minute narrated tours start at and return to the Eureka Springs Transit Center, just off Main Street. Great way to get a sense of the town. Our narrator is an ex-dam (not damn) superintendent, educational and witty. Recommend starting with this, rather than doing it at the tail-end as we did.